The first national marine sanctuary was established in 1975. Since then, the National Marine Sanctuary System has grown to include 13 sanctuaries and two marine national monuments. In 1990, Florida Keys National Marine Sanctuary became the ninth sanctuary to join the system, in response to concerns about the decline of the reef ecosystem in the area. Today, the sanctuary protects more than 2,900 square nautical miles of Florida Keys coastal and ocean waters. 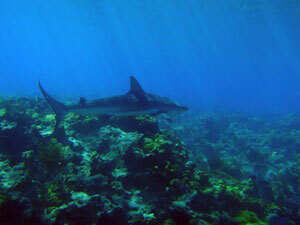 A blacktip shark swims across Looe Key Reef. Warning signs about the fragile and finite nature of marine resources in the Florida Keys were present long before Florida Keys National Marine Sanctuary was established. In 1960, to address the demise of coral reefs in the Keys, John Pennekamp Coral Reef State Park was established off Key Largo as the world’s first underwater park. Continued environmental degradation prompted the eventual designation of Key Largo National Marine Sanctuary in 1975 and Looe Key National Marine Sanctuary in 1981. Throughout the 1980s, oil drilling proposals, reports of deteriorating water quality, and evidence of declines in the health of the coral reef ecosystem continued to mount. These threats, combined with several large vessel groundings, prompted Congress to act. On November 16, 1990, President George H. Bush signed into law the bill establishing Florida Keys National Marine Sanctuary. This new sanctuary incorporated the preexisting Key Largo and Looe Key sanctuaries to protect 2,800 square nautical miles of Florida Keys waters. The sanctuary protects spectacular, unique, nationally significant marine environments that play an integral role in the Florida Keys economy. With the designation of Florida Keys National Marine Sanctuary, several protective measures were immediately put into place, such as prohibiting oil exploration, mining, or any type of activity that would alter the seafloor and restricting large shipping traffic. Also, anchoring on, touching, and collecting coral were all restricted within sanctuary waters. 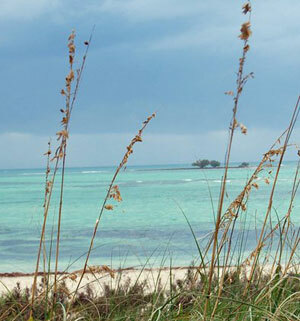 The passage of the Florida Keys National Marine Sanctuary and Protection Act in 1990 also called for the development of a comprehensive management plan. A set of public scoping meetings, followed by a series of workshops, collected input from federal, state, and local interests holding knowledge of sanctuary problems. These meetings, workshops, and extensive public input laid the foundation for the sanctuary management plan that was ultimately implemented in July 1997. Today, Florida Keys National Marine Sanctuary protects 2,900 square nautical miles of waters using an approach that addresses the variety of impacts, pressures, and threats to the Florida Keys ecosystem. The sanctuary is administered by NOAA and is jointly managed with the State of Florida.